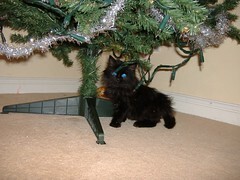 Look who's under our tree! This little chap is only a few weeks old, he was found in our warehouse at work this week, he was cold, scared and dirty. An email came round to everyone in the company asking if anyone could look after him, nobody local could help so Georgia and I travelled the 250 mile round trip on Friday to pick him up. We managed to get him straight into the vets, he was quite dehydrated and had a bit of a temperature, also really skinny... He's coming along well now though! It's not the first time a kitten has been found at the warehouse, we think a cat lives wild somewhere near the railway line and isn't great at looking after her brood. He's settling in quite well, Bumble (our other cat) isn't too chuffed about the whole situation but she's coming around slowly.